Tennis is one of the most popular individual sports in the world. In tennis the player uses a racquet to hit a ball over a net into the opponents court. The ball must be kept in play and can only bounce one time on the court surface before the opponent must strike the ball back over the net. The standard ball is made up of felt over hollow rubber. Tennis is often played with one player per side (singles) or with two players per side (doubles). An early version of Tennis started out in the 16th century in France where players would yell "tenez" when starting a game giving the game the name Tennis. Later the game would be refined in England in the 19th century as lawn tennis to more resemble the sport we play today. Tennis is played by people over the world as a great form of exorcize and recreation. There are also many levels of professional play in tournaments around the world. There are four top tournaments called the Grand Slam Tournaments. These are Wimbledon, the US Open, The Australian Open, and the French Open. Millions of people watch these tournaments making tennis a great spectator sport as well. Recently, tennis was added to the Olympics as an official sport. Tennis is a sport that has transcended age groups and is enjoyed by young kids as well as senior citizens. 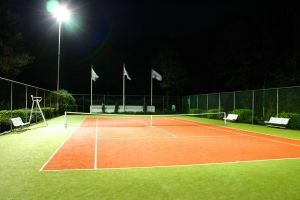 The basic area where tennis is played is call the court. This is a rectangular flat surface of varying types including concrete, grass, and clay. The standard tennis court is 78 feet long and 27 feet wide for singles matches. For doubles matches the width of the court is increased to 36 feet. A 3 feet 6 inch high net is stretched across the court, dividing the court in half. Tennis courts can be found in public parks, schools, and country clubs throughout the world. They can be outside or inside allowing for fresh air when the weather is good and year round play when the weather is bad. Hardcourt: This term includes many different surfaces including concrete, asphalt, wood, and Astroturf, just to name a few. Hardcourts are generally fast courts that have a good consistent bounce of the ball. Hardcourts are the most popular type of courts and most likely the court most amateur tennis players use. Clay: The clay surface is usually considered a slow surface because tennis balls lose speed when they hit the court. This surface also causes the ball to bounce higher than on other surfaces. This can make for long tennis rallies. Grass: Grass courts are the most traditional form of court as today's tennis was originally played on grass. Grass is considered fast like the hard courts, but the grass can be uneven and cause the ball to bounce funny making it difficult to return hard shots.